Most people who are new to scopes don’t realize just how many different reticle options there are out there and what kind of impact it can have on your hunt. But for those of us who are well accustomed to different scopes, the reticle choice often is a make it or break it deal when it comes to which scope we will choose. Mil-Dot reticles are very popular because of both the simplicity and range finding attributes they possess. This guide will familiarize you with Mil-Dot reticles and highlight our top five picks for the best Mil-Dot scopes. MIL is short for Milliradian, which is a United States military unit of angle. It looks like a series of dots on your reticle cross-hairs, and the MIL measurement is the distance from one dot to another. One dot north of center is 1 Mil, two dots north of center is 2 Mils, and so forth. One Mil equals about 36 inches per 1000 yards or 3.6 inches per 100 yards. It is more based on the metric system, being 10cm per 100m, or 1m per 1000m. These are very accurate and precise reticles for longer distance shooters. Many people may confuse Mil Dots with MOA measurements, but they are very different. Mil-Dots are much more accurate but really require more math. Each Mil-Dot represents approximately a 3.6-inch difference per 100-yards. MOA or Minutes of Angle may be a bit easier to calculate, but are not nearly as accurate and are better suited for hobby or shorter distance shooters. Hash mark to hash mark measures approximately 1-inch per 100-yards. With either style, you want to pay attention to the turrets on your scope. Scope measurements will be specifically in MIL or MOA, and that measurement may not match your reticle measurement. You want to match your turret clicks to your reticle, so if you’re working with a Mil-Dot reticle, you want your turrets to read Mil, and same goes for MOA. Both Mil-Dot and BDC reticles are distance estimating type reticles. Many hunters who have used both prefer the Mil Dots over the DBC reticles for numerous reasons. First of all, Mil dots are just easier to understand. Each dot ranges a 3.6-inch change per 100-yards. You can use this info to calculate out how much you need to elevate your rifle for whatever distance you’re shooting and still have an accurate aiming point to reference on your reticle. It is a very simple but effective concept. This makes them very good at longer distances. A BDC reticle is great for distances up to about 300 yards, then they lose a little bit of their accuracy. The frustrating part about a BDC that turn a lot of people off is that they are very specific in order to be accurate. Meaning they are only suited for the exact caliber, load, velocity, barrel length, and environmental conditions as they were tested in, otherwise they are not super accurate. With Mil-Dots, the design is giving you the benefit of multiple zero points, that can be adjusted for wind holdover, and different distances, whereas the BDC is preset. This can be fudged on a little bit as needed, but it takes much more calculation and math to figure it all out. These are a few of the reasons why so many hunters find the Mil-Dot reticles to be simpler, but superior to BDC’s. The Nikon ProStaff 4-12×40 features a Mil-Dot reticle with build in aiming points for easy elevation adjustments. It very easily adjusts with spring-loaded instant zero-reset turrets that are finger adjustable, with ¼-inch positive click knobs that are precise, gets you zeroed in quicker and allow you to maintain your setting, even under heavy recoil. The optics on this Nikon Prostaff scope are fully multi-coated for up to 98% light transmission for bright, high contrast viewing, while the body is nitrogen purged and O-ring sealed for waterproof, fog proof and shockproof performance. A quick focus eyepiece allows for instant and easy focus of the reticle. Some other great features of the Nikon ProStaff are the Spot-On Ballistic Match technology, Nikon’s limited lifetime warranty, and the Nikon no-fault repair or replacement policy. You get a great quality scope, and great protection policies to back it. Customers of this scope absolutely rave about it, saying it holds zero perfectly with no waver, has nice clear glass and a very easy to see reticle. People love the accuracy of the Mil-Dot reticle and say that the quality of this scope is amazing for the price. Some of the complaints about this scope are that the turret adjustments are in MOA while the reticle is in Mil-Dot. Some have also complained of poor packaging. 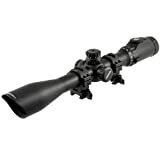 The Bushnell Trophy Rifle Scope is a 3-9×40 powered scope featuring a Mil-Dot reticle. It is a versatile, single piece tube constructed with fully multi-coated lenses, and a waterproof, fog proof and shockproof design. Bushnell is in the business of making high-quality, long-lasting scopes and this scope certainly will not disappoint! Customers claim that this scope is of a quality that more than meets expectations and is a very affordable option for the features that you get. They love the crisp, clear glass and the tough, quality construction. Most report that the Mil-Dot reticle is very precise. The only complaints noted about this scope are that the reticle is very small and that it won’t return to zero if dialed in for a certain distance. This Primary Arms 4-16x powered scope is a second focal plane scope, keeping the reticle the same size throughout all magnification levels. The Mil-Dot reticle is illuminated with a partial red illumination with 12 different brightness settings and offers the ability to switch back and forth between long-range and short-range viewing. This scope is built to be quite durable, being waterproof, shockproof and fog resistant. It features finger adjustable tactical-style turrets which are locking and re-settable. It adjusts in ¼ MOA audible clicks. This scope also features a side-mounted parallax knob to easily adjust the sharpness of the reticle and keep you parallax free. Customers of this scope seem to be most impressed with how well it holds zero. They also love how it is a second focal plane scope rather than a first focal plane scope. It seems many people have problems with the reticle covering up the bulls-eye on first focal plane scopes at higher magnifications. Not only this, but these customers also express that the quality and value of the scope are far better than similar scopes costing more money and that Primary Arms customer service is the best there is anywhere. As with any pro, there must be a con. Most of the customer complaints were varied and inconsistent, but several people did complain about the glass being dirty or having some kind of blemish or debris inside the optic. The UTG 4-16x powered scope comes not only with a high-performance Mil-Dot range estimating reticle and a built-in sunshade but is equipped and ready to go with its own max strength, twist lock Picatinny/Weaver scope rings too. These are nice tough scopes, built on the True Strength platform. They are completely and nitrogen filled, to deliver shockproof, fog proof and rainproof results. These UTG scopes some with a quick power selector ring which is perfect for quick target acquisition and zooming in. It also comes with a red and green dual color mode or 36-color in a multi-color mode, which is enhanced by the 1-click technology for quick access to your favorite color and brightness. So many color and brightness options really help to accommodate any weather or light conditions you could possibly be hunting in. The sweet finger adjustable target turrets on this scope are a premium zero lockable and zero re-settable with precise ¼ MOA per click adjustments. The parallax setting is a side wheel adjustable turret that adjusts from 10-yards to infinity. Customers of this scope are huge fans of the clear, crisp glass, the sharp image and the lighting capabilities it offers. They say that the clarity is excellent and the turrets are easy to turn and operate. Not to mention the ruggedness of this beautiful scope! The main complaint about this scope is that the reticle will start to rotate or other inner components break loose with heavy recoil. The Vortex Optics Viper is a very ruggedly built scope made of single tube construction with a hard anodized finish and is argon-purged and O-ring sealed making it waterproof and fog proof. It has capped reset turrets that allow quick re-indexing of the turret to zero after sighting in the scope. The parallax adjustment is a side knob that allows for quick and easy parallax adjustments while shooting. The glass of this optics is just as rugged as the rest of the body. Premium, fully multi-coated, extra-low dispersion lenses bring excellent resolution and color contrast, and the XR coatings enable heightened light gathering capabilities, while the Armortek coating protects the lenses. Additionally, this scope models a fast-focus eyepiece that allows for quick and easy reticle focusing, and a MAG-bar that allows for rapid, easy magnification changes. Customers of this scope praise its high quality and outstanding performance, claiming that it exceeded expectations at almost every turn! The glass is incredibly clear with sharp images and bright, stark contrast. Most really like the Mil-Dot reticle for its ranging abilities. However, there were a few complaints of reticle movement and malfunction with the optics. Also that the scope has trouble staying zeroed. Now you have a good idea of what to look for in the best Mil-Dot scope and why you may want to have a Mil-Dot reticle over another kind of reticle. These reticles are very likely one of the most versatile and useful reticles you could choose. If you want extreme simplicity and the best accuracy, a Mil-Dot scope may be the scope for you. As always, happy hunting! If you enjoyed this article check out our guide on the best scout rifle scopes or 22 mag rifle scopes.